A head and shoulders portrait of Andrew Ellicott. During the American Revolution, Pennsylvania did not just fight the British and their Indian allies. It also engaged in violent conflicts with neighboring colonies. In 1782, the Commonwealth secured its northeastern boundary and lands originally claimed by Connecticut. Four years later, the southwestern boundary, including lands originally part of Virginia, was finally fixed. Pennsylvania's northwestern border, however, continued to be a point of contention with neighboring New York.This region was of special economic importance, for it contained the so-called "Erie Triangle," a large parcel of land with frontage on Lake Erie. 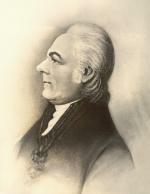 During the American Revolution, the Pennsylvania legislature sent General William Irvine to explore the area and offer recommendations on how the state could best use the region to raise revenue. 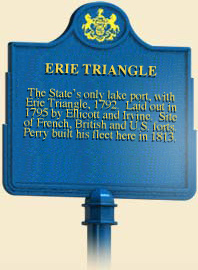 While on this tour Irvine looked for a harbor where Pennsylvania could build a trading post on Lake Erie, and on his return to the East, interested a number of investors in purchasing the Triangle. New York, however, had no intention of letting Pennsylvania take possession. In 1785, commissioners appointed by both state legislatures agreed to survey the disputed lands and purchase those required from the Seneca who inhabited them. The charter of New York set the state's western boundary along the south shore of Lake Erie to the forty-second degree of latitude, on a line drawn from the western extremity of Lake Ontario. To determine this line Pennsylvania and New York had to agree whether the "western extremity of Lake Ontario" included Burlington Bay, or began at the peninsula that divided the latter from the lake. Andrew Ellicott of Pennsylvania and Frederick Saxton of New York, the surveyors sent out to establish the boundary, decided upon the peninsula as the proper point from which to draw the line, and the western boundary of New York was fixed at twenty miles east of Presque Isle. This left a triangular tract, not included in the charter of either state, which became federal lands. On September 4, 1788, Congress ratified the contract for the sale of the triangle to Pennsylvania. Three years later, on April 18, 1791, the state legislature authorized Governor Thomas Mifflin to purchase the Triangle's 202,187 acres for $151,640.25. After the sale was completed in 1792, Seneca chief Cornplanter then agreed to sell Indian claims to the lands to Pennsylvania for $5,000, and an inland tract of land, granted to them in perpetuity under the Canandaigua Treaty of 1794, to which they then moved. Here they lived, in the last Indian lands within Pennsylvania's borders, until 1964, when the U.S. Army Corps of Engineers built the Kinzua dam to control flooding on the Allegheny and Ohio Rivers. To prevent the dam's construction, the Seneca sued the federal government.They lost in court, but did receive $15 million in damages. The Kinzua Dam then flooded the last tribal lands in Pennsylvania and forced 130 Indian families to relocate to New York. Not all the Indians left the Erie Triangle. In 1794 Governor Mifflin prepared the state militia for hostile action against them to take over the triangle. President Washington, realizing the potential for frontier anarchy if states could undertake such expeditions on their own, and dealing with Pennsylvania's Whiskey Rebellion at the same time, persuaded Mifflin to refrain until new treaties could be negotiated. 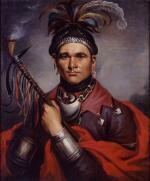 After the Battle of Fallen Timbers on August 29, 1794, the remaining Indians, led by Mohawk chief Joseph Brant, realized their cause was hopeless and ceded their lands. Most went to New York, although Brant led a significant minority to Canada. That year, the first white settlers were able to move into lakefront property and founded the city of Erie in 1795. Samuel P. Bates, History of Erie County, Pennsylvania (Chicago: Warner, Beers and Company), 1884. 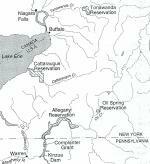 Joy Ann Bilharz, The Allegany Senecas and Kinzua Dam: Forced Relocation Through Two Generations (Lincoln: University of Nebraska Press,), 1998. Helene Smith and George Swetnam, A Guidebook to Historic Western Pennsylvania, 2d. ed. , 256-271 (Pittsburgh: University of Pittsburgh Press), 1991.